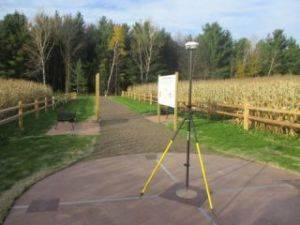 Seiler Instrument is proud to have helped along with many other local surveying firms with the building and monument restoration/relocation of the 45th Parallel of Latitude and the 90th Meridian of Longitude. In short, this is known as the 45-90 Geographic Marker, which is the center of the Northwest Hemisphere. 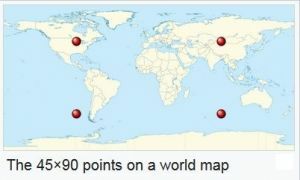 There are only four of these points in the entire Earth and two are under water, one is in the mountains of China and the fourth is in Marathon County, Wisconsin. The Marathon County Surveying staff had been working with the Marathon County Parks and Highway Departments to update the monument, and was granted an easement from the current landowners to build a path along the edge of his field to set a monument at the exact position of the intersection of 45⁰N Latitude – 90⁰W Longitude. The many Surveying Organizations who donated and details on this project are listed in the related article link here from WSLS.org. Last week the park celebrated it’s opening with a ribbon cutting ceremony. Seiler really appreciates all the Surveyors who got involved on this project and we would also like to thank our own Terry Lueschow, PLS for his personal help in this project as well. 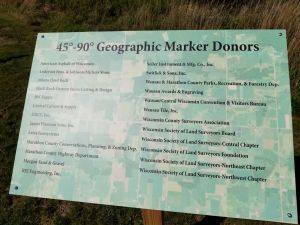 You can learn more and view the video from the opening ceremony from the WJFW / NewsWatch12 article here: Marathon County celebrates unique landmark with marker and ribbon cutting ceremony. 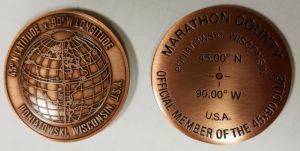 Further reading: Marathon Conservation Planning and Zoning here. Cool story and images. Thanks for sharing.